Conformal coating atomised spray application using a spray gun is an excellent method for applying coatings to printed circuit boards. However, the problem can be that depending on the coating used, the circuit board to be coated and the thickness tolerance demanded, it can be difficult to get repeatable results. This search quickly found there was no perfect answer until SCH began work with TE Connectivity. They were developing exactly what SCH were looking to find a customer project. However, using an atomised spray nozzle with a programmable XYZ system allows repeatable atomised spray results with fixed distances, patterns and speeds. This non-selective approach applies an even film of conformal coating over circuit boards without significant operator expertise and gives control to the film thickness without operator interpretation found in manual spraying. How do I control my conformal coating thickness with my dip system? The viscosity of the conformal coating can be monitored by utilizing a flow cup. There are many designs but is essentially a cup with a hole in the base on a wire. You dip the cup into the liquid and lift it out of the conformal coating. you then time taken for the coating to empty from the cup. Since the volume of the cup is known and fixed, you can relate the time to the viscosity of the conformal coating and you get a relatively accurate and simple method of measuring viscosity which is certainly suitable in 99% of cases. Using typical conformal coating dip systems like the DS101 dip system, the dip speed is controlled by air over oil hydraulics which can control the speed down to 2″ (50mm) per minute. This is very precise and more than adequate for conformal coating thickness control and repeatability. The key to dipping is to realise that the slower the withdrawal speed the thinner the conformal coating applied. Control these two factors and you have a very repeatable conformal coating process. 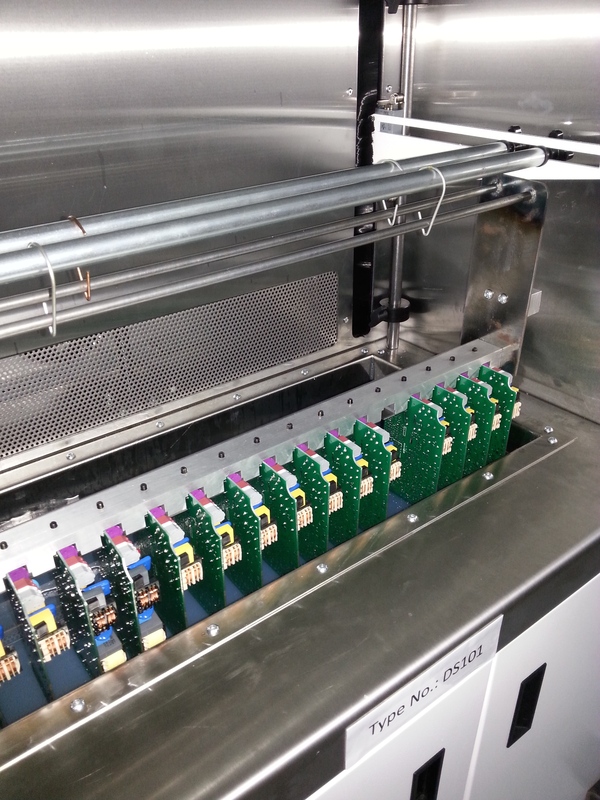 Click DS101 Conformal coating Dip System for further information on the dip machines. Can I horizontally dip my printed circuit board in conformal coating and achieve a good finish? In fact we can dip your PCBs at any angle you choose. The key is control of the dipping depth and being able to hold the PCB. 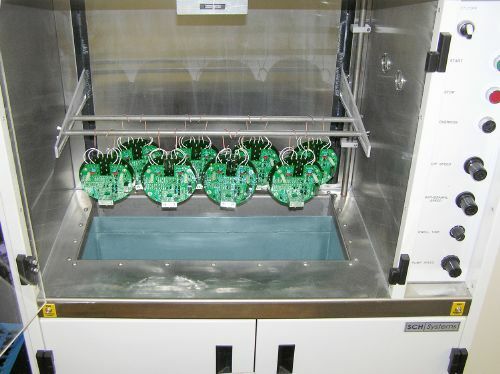 If we can achieve both successfully then it is perfectly possible to horizontally dip PCBs using automated batch dip coating machines such as the DS101 dip system. There are many factors to consider such as the size of the board, the depth of dipping allowed, the type of conformal coating to be used, how to hold the PCB and the masking & components on the board that must be considered. However, SCH regularly use this technique to minimise costs for customers. We can develop the fixtures to support the PCBs as well as design for multiple dipping of the boards. Parylene coatings are completely conformal to the surface of the PCB. This means that they have a uniform thickness and are pinhole free. As a result, component configurations with sharp edges, points, flat surfaces, crevices or exposed internal surfaces are coated uniformly without voids. This provides the best protection possible, can make the circuit board “waterproof” and is impossible to achieve with liquid conformal coatings. Parylene coatings are chemically and biologically inert and stable and make excellent barrier materials. Parylene conformal coating has excellent electrical properties: low dielectric constant and loss with good high-frequency properties; good dielectric strength; and high bulk and surface resistance. Parylene is completely transparent and can be used to coat optical elements like LEDs without changing the properties of the device. Parylene conformal coating is both MIL-I- 46058C and IPC-CC-830B listed. Parylene has achieved FDA approval of when used on devices and is well-documented. Parylene coating completely penetrates spaces as narrow 0.01mm (10 microns)giving you a complete coverage of a circuit board. Parylene is unique in being created directly on the surface at room temperature. Room temperature formation means the conformal coating and the parts are effectively stress-free. Under fills are used to fill the gap under components like flip chip components. The materials are specifically designed to match the coefficient of thermal expansion (CTE) of the device on the board so that any CTE change does not mean the component pops off the board or gets damaged. Conformal coatings are not designed for this process and CTE mismatch can lead to severe damage of devices such as BGAs. Do not specify the use of conformal coating as an under fill EVER. If a device needs to be under filled, specify a formulated under fill. Or, be prepared to find the component lifting off the PCB in the long term. The Rules for Selective Conformal Coating are straightforward. Follow them and you can save money and time in your application process. However, if the Rules are not followed, the resultant circuit board design can challenge even the most sophisticated conformal coating system and its operator to achieve the finish desired. Click Designing Circuit Boards for Selective Robotic Conformal Coating for further Rules. 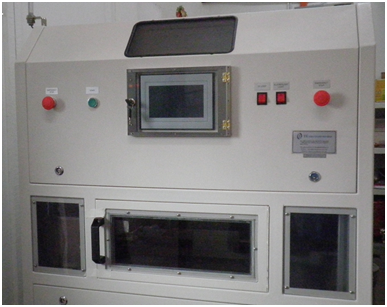 Can the capacity of the DS101 conformal coating dip tank be reduced? SCH can make the tank any size you want. However, there is a ratio of surface area of the tank to depth that is important. If you have too little volume of coating in relation to the surface area, the evaporation of the solvent will change the viscosity of the tank too quickly and you will constantly be monitoring it. We have no formula for this but making it too shallow could be a problem. Click Conformal Coating Dipping FAQs to find out more about this and other issues relating to the process. How is the height of the conformal coating material in the tank controlled on the DS101 dip coating system? On the DS101 dip coating system there are two parts to the tank. These are the dipping area and the sump, which are separated by the weir edge. The material is pumped into the tank, over the weir into the sump. Therefore, the weir edge holds the height constant and the weir sump drops with material use. Monitoring the weir sump depth is crucial again to learn how fast it is drained. We recommend a 25mm (1”) edge difference between the top of the weir and the sump material and keeping the material close to that avoids a wide evaporation area over the weir which means more solvent evaporation. This can also be critical with materials that do not re-dissolve into the material when dry like water based coatings. If they do dry /cure then these bits float around in the sump and then eventually could clog the pump. We would recommend using a stainless steel basket which we have designed to catch these bits like a sieve and any other bits floating (or even PCBs dropped! ).